Both real estate and stocks have had their day, but the question you need answered is this: Which contender is the superior long-term bet today? Real estate has packed quite a punch of late, appreciating 12.4% annually between 2001 and 2006, according to the S&P/Case-Shiller U.S. Home Price index. That clobbered stock prices, which gained only 4.3% a year as measured by the S&P 500. 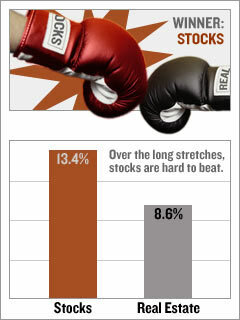 But over the long run stocks win easily. A new study by Jack Clark Francis, a finance and economics professor at Baruch College in New York City, and Yale's Roger G. Ibbotson compared the annual returns of real estate from 1978 to 2004 compared with those of 15 different "paper" investments, including stocks, bonds, commodities futures, mortgage securities and real estate investment trusts (REITs). The results? Housing delivered a solid but unimpressive annualized return of 8.6%. Commercial property did better at 9.5%. The S&P, however, delivered a crushing 13.4%. Other studies argue that real estate's returns are much worse. Yale finance and economics professor Robert Shiller, author of Irrational Exuberance, who looked back to 1890, contends that only twice has real estate produced truly outstanding returns: after World War II, when returning troops were starting their families, and from 1998 to 2005, a period he thinks is a bubble. Housing's rate of return, he argues, has to trend back to the mean of about 3% a year - barely above the inflation rate. If that's starting to happen now, he says, we could be facing many years of losses. Before you decide that real estate is already down for the count, though, consider this: Equity REITs, which own stakes in commercial properties, were among the best performers in the Francis-Ibbotson study, with annual returns of 14.8%. But REITs are stocks, after all.